The two men facing felony hate crime charges for allegedly attacking a member of the East Bay’s large Sikh community pleaded not guilty Monday morning in Contra Costa County Superior Court in Richmond. Chase Little, 31, and Colton Leblanc, 24, allegedly assaulted Maan Singh Khalsa while he was sitting in his car at an intersection near Richmond’s Hilltop Mall on Sept. 25. The two defendants allegedly beat Khalsa, pulled off his turban and cut off a fistful of his hair using a pocket knife. 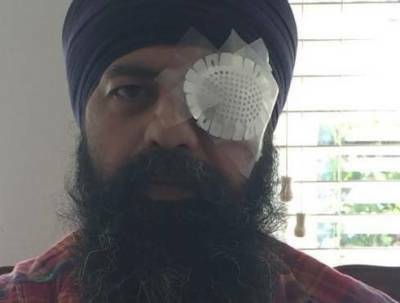 Khalsa suffered a black eye and dental damage. And one of his fingers needed to be amputated after a knife wound became infected. Following Monday's hearing, Contra Costa County Deputy District Attorney Simon O’Connell said the act of cutting Khalsa’s hair, “an artifact to his faith,” is what distinguishes this as a hate crime. Unshorn hair is considered sacred to the Sikh religion. “Had this been just an assault -- a road rage-type incident -- we might be dealing with a different situation,” O’Connell said. Little’s attorney, Julia Jayne, said she’s confident her client will be exonerated and denied the attack was a hate crime. “Mr. Khalsa was absolutely not targeted because of his religion or because of his background,” Jayne said. Jayne said she is looking for video of the incident, which she says will prove her client was present, but not actively involved in the attack. However, O’Connell said the prosecution has found no video evidence of the assault. He says there is physical evidence and eyewitnesses, including some who were riding in a truck with the defendants before the attack. Little and Leblanc, both of Texas, were contract workers for Chevron's Richmond refinery. The company has since fired both men. A preliminary hearing in the case is scheduled for Feb. 16, 2017. Both defendants are free on bail.